Robyn Millar is a Canadian artist working in acrylic paint on canvas to create one-of-a-kind original artwork. Her Pet Portrait paintings and Custom Art commissions are steadily gaining popularity in Calgary Alberta where she lives and works, as well as throughout Canada and beyond. Originally from rural British Columbia (near Nelson), Robyn spent her childhood surrounded by beautiful scenery and spacious nature. This exposure to the tactility and hues of the natural world continually inspires her, with organic textures and colour palettes regularly reflected in her art. Robyn’s a self-taught painter, displaying aspects of realism techniques as well as painterly stylization. 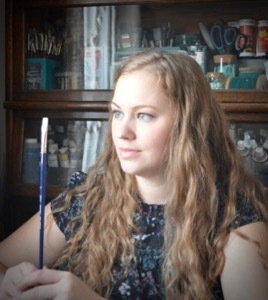 Though her medium of choice is acrylic paint due to their vast versatility, she also thoroughly enjoys exploring oils, watercolour, and mixed media techniques.